When the E21 3-series was introduced, the 320i -being the only fuel injected version- was the only engine that could meet the strict U.S. emission standards. A 3-way catalyst was fitted with Lambda control and a oxygen sensor. Dash: mph speedometer, fuel gauge not showing litres but: full, ½, reserve. When the European E21’s were facelifted in 1979, the U.S. 320i was renewed as well. BMW stopped production of the 2 litre M10 engine en they decided to sell the Euro 318i as the new 320i. The smaller displacement and U.S. restrictions made the new version considerably less powerful but the lightened facelift chassis made up for at least part of the loss. Due to a different climate, many air conditioned E21’s were sold in the U.S. Over here in Europe E21’s with A/C are rare! The comfortable and reliable optional ZF 3-speed auto box was popular as well. Strangely, power steering wasn’t! I believe the 320i models sold in Australia and the U.K. were practically the same. Only thing is that they were converted to RHD which required relocation of the brake master cylinder. Maximum Speed (kph)* ? ? ? NOTE For further information on options, gearbox types, fuse box lay out, paintwork and interior colours, valve clearances, etc. 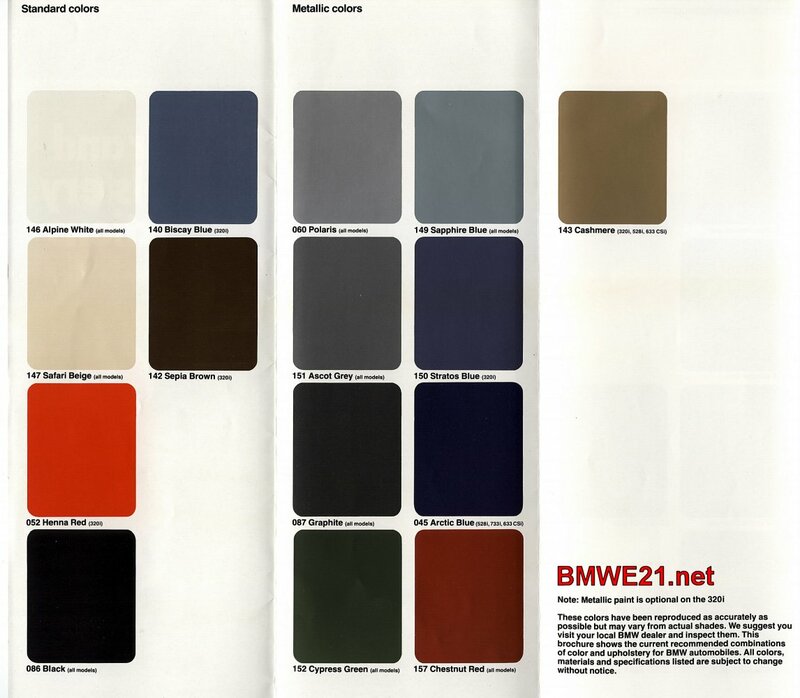 see the regular E21 specs pages on this website.